In closing, thank you all for your input here and let us keep the talk hounourable and above board. My guess is about 6 to 8 Mbo/d for peak output for tight oil, maybe 2021 to 2024 for peak year. Lower peak at low oil price level ($65/b) and higher peak at higher oil price level ($100/b). In my (somewhat educated - I frac for living) view, sustained production from shale is not achievable. It will continue as long as operators can get cheap capital injection and could maintain plausible profitability story with investors. Some operators are making money, just not the industry as a whole. ^ Noteworthy comment. I bolded it for emphasis. Somewhat off topic: There is far more methane along the coastal waters of the USA than there is in all of the Land deposits including shale. The Japanese have already designed a way to extract it, although I don't know the economic cost. My assumption is that when and if we need it we will be able to access it. There is also a tremendous potential for tapping biogas in many ways. There﻿ is far more methane along the coastal waters of the USA than there is in all of the Land deposits including shale. The Japanese have already designed a way to extract it, although I don't know the economic cost. Methane hydrates are abundant, but the last time I checked (a few years ago) it is not even close to being economical to extract and process. If someone could invent a cost effective way of "mining" subsea methane hydrates, they could be exceedingly rich. Debt is a big problem which cannot be ignored... no matter how fast the U.S. Shale Oil industry runs on the hamster wheel of debt, if debts are not paid off, happy endings seem unlikely. I've read elsewhere that the bulk of the "easy" U.S. Shale Oil sweet spots will be mostly depleted by 2025 or so. Steve is a long-time proponent of idea we are running of energy. His view on oil is based on thermodynamic paper with flawed assumption that oil is a primary source of energy while in reality it is used as transportation fuel. But I do agree with assessment based on debt wall thing. Agreed DanilKa. 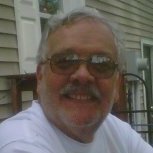 SRSrocco (Steve) can go a bit overboard in the doom and gloom department, but he does raise some valid points about debt. If interest rates (the cost of credit) go up significantly, the U.S. Shale Oil party is gonna run outa beer for the party, and pretty darn quick. Debt is the Shale Oil elephant in the room. Shoving the elephant over to the corner and throwing a tablecloth over the elephant doesn't actually make the elephant go away. Is Shale Oil / Gas just a byproduct of the last decade of ZIRP. When / if interest rates return to historical norms will Shale disappear or will it have gained sufficient economy of scale to overcome this challenge? People think shale when discussing this phenomena, but actually it is a revolution in horizontal drilling, combined with slick water fracking. This creates more permeability, and is being used mostly in shale rocks now. Look for it to be used more in sandstones and carbonates in the future, as there are many types of source rock that can be developed with this technique. yes and no, @NickW. It would not be possible for industry to amass ~$400B+ (and stare at a $110B debt wall in 2018 alone) without ZIRP. Chanos calls them "creatures of the capital market". On other hand, shale well have to make money in first 2-3 years of its operation so one does not need long term debt and can grow organically (in theory, there is no theory between theory and practice; in practice - there is...). He's spot-on about the potential for shale, be it oil or gas, to pull us out of the next recession. We danced in the streets here in Marcellus, despite what was (and is still) happening in Detroit and Cleveland. 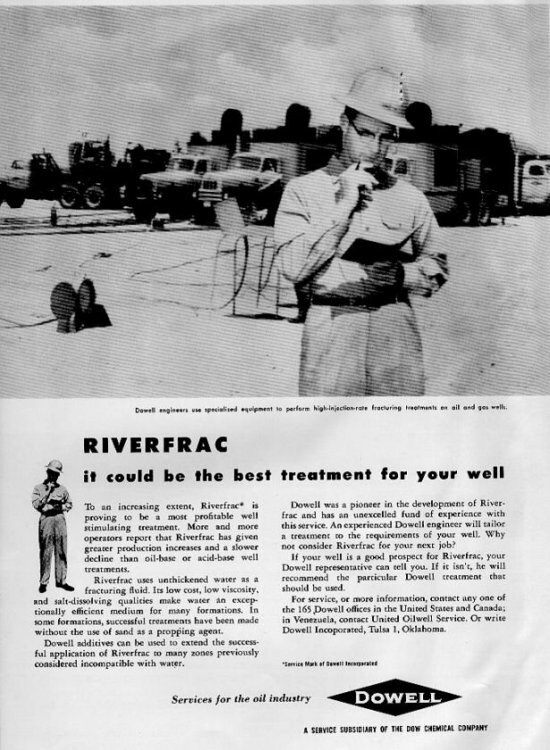 hydraulic fracturing started in carbonates - acid fracs by Dow (later Dowell) in 30-th; sand frac in Jul-1947. Slick water isn't new either (see below). "Shale" is not an accurate name - bundles carbonate, quartz rock with various amount of clays (some very little) organic rich rock into one. Already in development. Some efficiency tricks and completions from shale may benefit conventional reservoir but its already happening. Bottom line - there is no new disruptive technology when it comes to producing oil from kerogen via nanoDarcy-range permeability. Btw, hydraulic fracturing creates (enormous) contact area with the source rock, it still has to have >~100nD to produce. There's a steep initial decline rate, but it *appears* steady after that. I've seen charts for individual wells predicting production 20+ years out. Of course, we don't yet have fracked shale wells that old and so can't prove they'll produce that long, but it's within the realm of possibility. - At what point does production from old, steady wells exceed production from new wells? When that happens, will shale output stabilize? - Are the long tails of shale production actually steeper than those of standard wells, explaining the predictions of shale decline? - Is shale's problem the slow rate at which oil flows through the rock adjacent to the well (hence, the fracking), or is there some other limitation that causes production to decline? - What assumptions were made when shale's decline was predicted? Did they model a variety of cases, or did they base it all on a single set of assumptions? One would hope the people making predictions have answered these questions, but given the track record of forecasters in general (economists in particular come to mind), I'm not ready to suspend disbelief. What do y'all think? The models I present assume the mean TRR estimates by the USGS for the Permian and Bakken are correct and that David Hughes estimate for the Eagle Ford is roughly correct (see Drilling Deeper), I guess at the TRR for the rest of US LTO and apply economic assumptions based on the work of Rune Likvern and comments by Mike Shellman. Well profiles are based on data from shaleprofile with hyperbolic decline curves fit to the data. Oil price scenarios are based on the EIA's AEO reference case, with high and low scenarios midway between high and refernce cases and low and reference cases. For the chart I presented I assume new well EUR starts to decrease after Jan 2019. Note that pushing this forward in time (to say 2021 or later), but leaving TRR estimates unchanged might move the peak by a couple of years, but would result in steeper decline rates for US LTO output after peak output is reached. Note that other scenarios can easily be done with higher or lower TRR, but the 90% range (5% probability that TRR will be higher or lower) is about 40 Gb to 80 Gb for US LTO based on USGS and other estimates with a 50/50 chance it will be higher or lower than 60 Gb. The 60 Gb case was used in the chart presented, when the Oil Price scenario and reasonable economic assumptions are applied the ERR (economically recoverable resources) falls to 45 to 55 Gb in the low and high price case respectively. 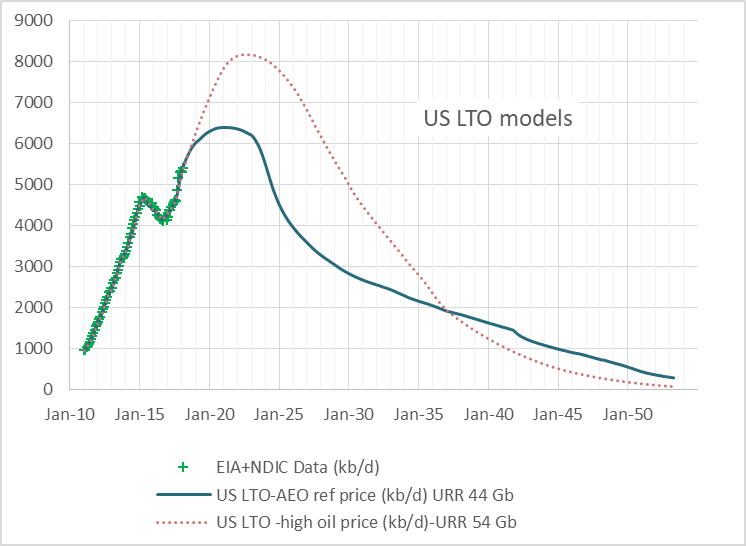 Using the EIA AEO 2018 reference oil price case the US LTO peak will be about 7.5 Mb/d in 2022, ERR may be about 51 Gb with 239,000 tight oil wells completed from 2005 to 2050. Note that roughly 85,000 tight oil wells have been completed in the US through June 2018 (about 6800 wells per year on average from 2005 to 2017). The average rate of well completion from 2018 to 2050 is about 5100 wells completed per year. You might like this article. I find it confusing that pipelines are being built if , as you say, the long term shale is not going to be there. I heartily disagree. We just need to keep interconnecting pipelines to new found shale fields IMHO. Shale oil is Kerogen is a microstructure of HydroCarbon from organic matter but that hasn't been there for millions of year but for billion of years. And it came from algae and bacteria, the total kerogen in earth crust is around 10^16 Tons which is 628,981,077,043,210,496 barrels, okay only a fraction of that is recoverable, the rest has little hydrogen content to be considered oil or be very usefull as hydrocarbon, but is still a huge ammount of "Oil" to handle. As mentioned above there's no such thing as disruptive technology for the extraction of kerogen oil, only small improvements give results, first was in situ-recovery during the experimental age, then it was in-situ recovery, then single-well fracking, enchanced-lateral drilling, multi well drilling, multi-lateral drilling which what most new wells have today and with stuff like supercritical CO2 for extraction it can become cheaper, less enviromentally disruptive and having higher recovery rates. The problem that peak oil always had is that everyone seems to think when the Oil Price is high than we only have oil for 4 years, and they kept saying that since 1974, maybe we will se peak Crude before peak tight-oil or peak shale. Sebastian, another problem is the common assumption that oil must be the primary fuel of transportation. There are other options that are potentially competitive: Natural gas as LNG or CNG, biogas, methane hydrates, methanol, ethanol, electricity from solar and wind or all of the above. As scientific and technological improvements are made energy continues to look more abundant and cleaner.